Originally published in 1992, Channeling is a comprehensive bibliography on the subject of channeling. The book defines channeling as any message received or conveyed from transcendent entities and covers material on the history of channeling, those that have claimed to transcend death, contact with UFOs and contemporary channeling groups. The book acts as a research guide and seeks to outline the historical roots of channeling, explaining its major teachings and considers its significance as a spiritual movement. 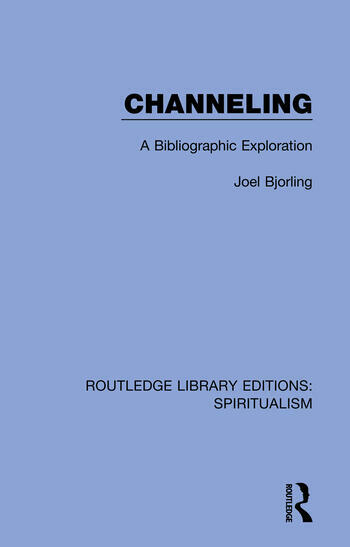 It provides sources from books, booklets, articles, and ephemeral material and offers a comprehensive list of both primary and secondary materials related to channeling, the bibliography takes the most diverse and useful sources of the time. This volume although published almost 30 years ago, still provides a unique and insightful collection for academics of religion, in particular those researching spiritualism and the occult.